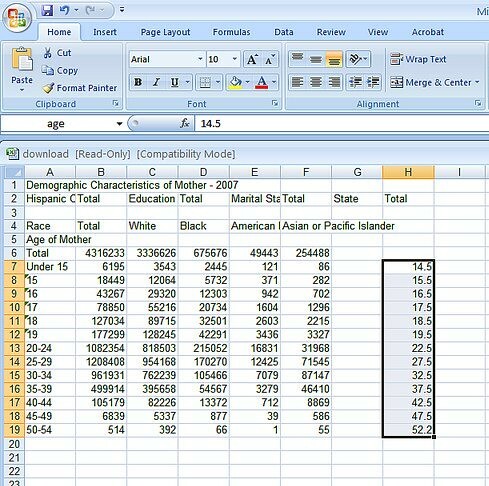 So with the data in excel (which you can learn how to export and where on the notes for August 24th), we spoke about what the average (using the midpoint) age of women would be at all age groups. We decided upon these because, for example, an age group of 16 would cover the girls age at the very day she turned 16, till the day before she turns 17, so an average age of 16.5 would be appropriate. Here is the image of all averages. We also named the group age to be able to quickly write a formula for the weights. Long hand, what we are really doing is weighted averages (which is what demography is most concerned with). which gives us our weighted average. You do this for all values by copying the equation and pasting on rest of the slots in the column. *Census is not continuous because it is not counting all the time.